Becomes member of the PEN Club (founded in London in 1922). Co-founds the “Ring of Hanoverian Authors” with Christof Spengemann and Carl Credé. Trip to Switzerland; represented in “neue werbegraphik“ (“new advertising graphics”) exhibition in the Gewerbemuseum, Basel; catalogue text about the “ring neuer werbegestalter”; three readings in Zurich and Basel. Included in the “1ère exposition internationale du groupe Cercle et Carré” in Paris. Reading (of, among other works, An Anna Blume and Schacko) at the matinée “Künstler in Front” in the Capitol-Hochhaus in Hanover; presumably his last public appearance as a recital artist in Germany. Annual summer trips to Norway; stays primarily in Djupsvashytta Hotel by Lake Djupvand, in Moldefiord and on the island of Hjertøya. Earns his living by selling landscape paintings. Merz 21: erstes Veilchenheft published (the issues Merz 22 Entwicklung and Merz 23 e. E. were announced but did not appear). Elected Honorary President of the Société Anonyme. Represented in the following shows organized by the Société Anonyme: “Special Exhibition Arranged in Honour of the Opening of the New Building of the New School” and “International Exhibition Illustrating the Most Recent Development in Abstract Art”, New School for Social Research, New York (subsequently in the Albright Art Gallery, Buffalo). Becomes member of the artists’ association Abstraction-Création, Paris. Photographs of the Merzbau and other works reproduced in the journal of the same title 1932-1934. Death of his father Eduard Schwitters. Represented in a show by the “ring neue werbegestalter” in Essen and (as part of an international exhibition of advertising prints, photos, and photo-montage) at the Stedelijk Museum, Amsterdam. These are the last public presentations of work by the “ring neue werbegestalter”. Trip to the Netherlands, visits Lajos d’Ebneth in Kijkduin by Scheveningen; attends 9th congress of the PEN Club in The Hague. Merz 24 Ursonate published (typography by Jan Tschichold). The artists’ group “die abstrakten hannover”, which was founded in 1927, begins to gradually disband. Represented in the jubilee centenary exhibition of the Hanover Kunstverein. Seven-week cruise accompanied by Helma Schwitters (Guernsey, Brittany, Madeira, Southern Spain, Morocco, Italy). Recording of the scherzo from the Ursonate and the poem An Anna Blume for the broadcaster Süddeutscher Rundfunk Stuttgart. Becomes a member of the German Social Democratic Party. Leases a cottage on the island Hjertøya in the Molde Fjord and begins to convert it into a Merz building. Member of the Deutscher Werkbund (had probably joined earlier, but membership in 1933 is documented). In the course of the following years, increasing withdrawal into “inner emigration” and concentration on the Merzbau (Merz building) in Hanover. Defamed in the exhibition “Novembergeist: Kunst im Dienste der Zersetzung“ (“November Spirit: Art in the Service of Moral Corruption”) in Stuttgart and Bielefeld, organized by the National Socialists (presumably only reproductions of Schwitters’s works were shown). The story Schacko published under the pseudonym Peter Krüger in the periodical Zirkel: Magazin für Wissenschaft, Kunst und Technik (no. 1), edited by Hanne Bauer-Rasch. Travels to Oslo with Ernst Schwitters; solo show (landscapes) in Blomqvist art dealer’s in Oslo. Travels to Berlin for the opening of the Futurist exhibition “Aeropittura”, meets Filippo Tommaso Marinetti. First meets his later friends Hans and Suzanne Freudenthal from the Netherlands. Represented in the autumn show of Hanover artists at the Hanover Kunstverein. This is the last presentation of Schwitters’s work in National Socialist Germany, apart from inclusion in defamatory exhibitions of “degenerate art”. Visits Hans and Suzanne Freudenthal in Amsterdam. 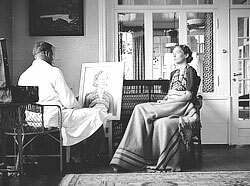 Alfred Barr jr. (director of the Museum of Modern Art, New York) pays a visit to Waldhausenstrasse, Hanover, but does not meet Schwitters in person. Barr views the Merzbau and purchases a collage for the Museum of Modern Art, New York. Represented in the exhibition “Tentoonstelling van modern schilderwerk, grafiek, reclame en fotografie” in De Nieuwe Kunstschool, Amsterdam. Travels to Rotterdam and Amsterdam; visits Hans and Suzanne Freudenthal. Travels to Paris, visits Hans Arp and Sophie Taeuber-Arp; meets Piet Mondrian. Trips to Switzerland and the Netherlands; visits Edith and Jan Tschichold in Basel; visits Hans and Suzanne Freudenthal in Amsterdam (end of March). Included in the exhibition “Cubism and Abstract Art” at the Museum of Modern Art, New York. The Gestapo in Hanover arrests his friends Christof and Luise Spengemann and their son Walter. Travels to the Netherlands; visits Piet Zwart and Hans and Suzanne Freudenthal. Fruitless attempts to find parties in the USA interested in his Merzbau. Included in the exhibition “Fantastic Art, Dada, Surrealism” in the Museum of Modern Art, New York. 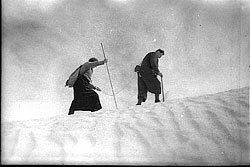 Schwitters’s 18-year-old son Ernst flees to Norway on 26 December. 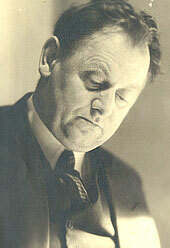 Kurt Schwitters follows on 2 January 1937 and in view of the political situation decides not to return to Germany. Lives in Lysaker near Oslo and, in the summer months, in Molde (officially registered as resident already on 10 November 1936). Helma Schwitters remains in Hanover and spends only a few months annually in Norway up to 1939. Important works are gradually moved from Hanover to Lysaker. 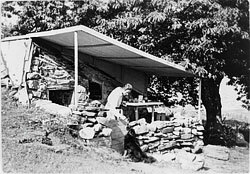 Kurt Schwitters begins work on a new Merzbau in Lysaker, the Haus am Bakken, which was destroyed in a fire in 1951. During exile in Norway, and later in Great Britain, he increasingly produces figurative drawings and paintings (primarily landscapes and portraits). Represented in the “Konstruktivisten” exhibition at the Kunsthalle in Basel. More works by Schwitters expropriated from German museums (in Berlin, Hanover, Mannheim, Breslau, Saarbrücken and Wiesbaden, among other places). Second “Degenerate Art” exhibition begins, with itinerary taking in Munich, Berlin, Leipzig, Düsseldorf and Hamburg, and ending in Halle on 20 April 1941. Presentation of abstract works (for instance The Merzpicture, 1919, Ring Picture, 1920-21, Merzdrawing 190, 1921, und Mz 195 The One, 1921) in the context of Dadaist works that are described as “utter insanity”. 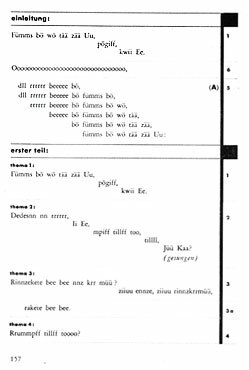 Collaboration with the Norwegian composer and organist Thorolf Høyer-Finn leads to the play Hvad er sannhet? (German title: “Wahrheit” - “Truth”). Sells five collages to Peggy Guggenheim. Represented in “Exhibition of Twentieth Century German Art”, New Burlington Galleries, London (organised in protest against the Nazi “Degenerate Art” exhibition). Represented in the exhibition “International nutidskunst. Konstruktivisme, neoplasticisme, abstrakt kunst, surrealisme” in Oslo. Travels to Stockholm, Copenhagen, Göteborg. Poems and a drawing published in the periodical Plastique (no. 4), edited in Paris by Sophie Taeuber-Arp. Family celebration in Oslo (80th birthday of his mother, Henriette Schwitters, and engagement of Ernst Schwitters to Esther Guldahl); last meeting with Helma Schwitters.